Anthony Woodburn deals in fine antique clocks - 17th & 18th century English antique bracket clocks, longcase clocks and antique barometers, including pieces by JOHN HARRIS, London. 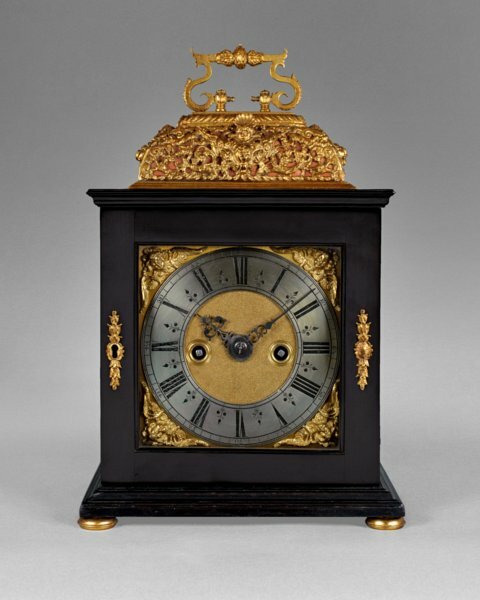 A fine William and Mary quarter repeating spring table clock contained in an ebony and gilt brass mounted case of small proportions. Standing on brass bun feet, there are matching foliate escutcheons to the front door and a pierced repousse basket top surmounted by a foliate tied scroll handle. The 6½ inch (16cm) square brass dial with matted centre and ringed winding holes is mounted with a silvered chapter ring and winged cherub spandrels. Above twelve o’clock is a strike/silent option and the blued steel hands are finely pierced and faceted. The eight-day duration movement has six ringed pillars, verge escapement with a pierced apron and pull quarter repeat on four bells, the hours sounded on a separate bell. The back plate is delicately engraved with tulips, thistles and foliate scrolls around the maker’s signature, John Harris, London. The exposed steel click work mounted on the back plate, is also finely engraved. John Harris is recorded as working at Holborn Bridge from c1660 and was succeeded by his nephew Charles.